An original Chelsea Clock Mariner, shipped from our factory on December 17, 1946 to Abercrombie & Fitch. This beautiful 6" Mariner is a handcrafted original 63 year old timepiece that has been fully restored by Chelsea Clock technicians. The case is forged from brass and bronze. 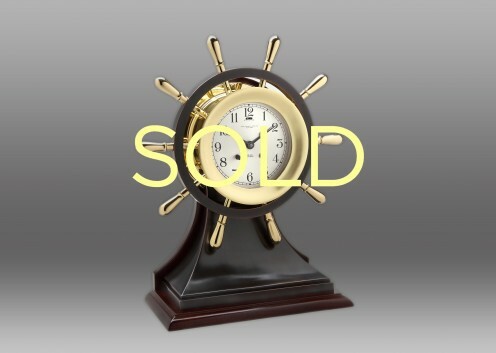 Clock is equipped with a Ship’s Bell Mechanical movement, and strikes the original ship’s bell code. The Dial is hand-silvered, featuring spade hands and arabic Numerals.